Use top layer genuine cow leather, soft feeling and strong tenacity. Durable great hardware, precise stitching and environmental friendly contract color oil edge, makes the bag more stereo. Bottom with rivet protection which extends the use age. A never out of style designer bag. A lifelong collection on your closet. ➤Capacity: The leather tote has an main pocket covered which is concealed with two leather straps for the vintage look. Fully cotton lining.The bottom is fully leather reinforced. A detachable zipper pouch for Iphone 7plus.It has two slip-pockets and a zipped pocket. It also has padded compartment for a 15.6 inch laptop. The large main pocket has a heavy duty and smooth zipper.It has a secured zipped pocket at the back. ➤The Leather Tote fits for work,travel,school,college going students for carrying books, notebooks and it has compartments to store basic necessities such as keys, stationaries,calculator, cellphone, wallets, a 15 inch laptop, cameras, iPods, iPads, tablets etc.This design makes it being the perfect gift for your loved ones or a treat for yourself. 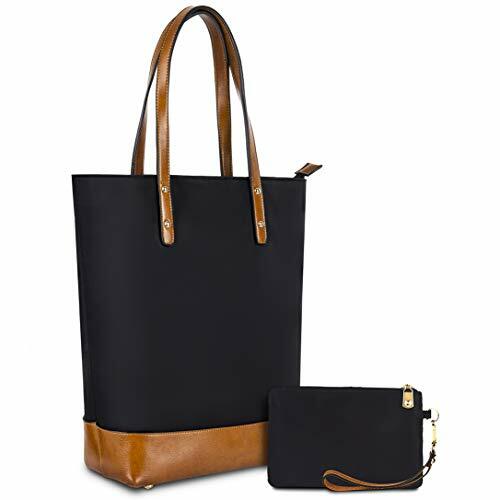 ➤The leather Tote Design: 1 main pocket covered which is concealed with 2 leather straps. Fully high quality lining.The Hardware are high quality in gold and has 4 golden Studs at the bottom. And 1 zipper pocket at the backside. Inside it has 1 zipper pocket and 2 open pockets with also a keys leather straps. And also there is a wristlet with 3 cards slots.